Conventional merchandising systems have long relied on the use of traditional materials such as laminated MDF panels and veneered timbers between slotted uprights to achieve the required look. Whilst this type of installation looks great and can offer almost endless possibilities, it also generally requires a team of specialist shopfitters to install and, therefore, refreshing the look of your store can be a major undertaking both in terms of effort and expense. 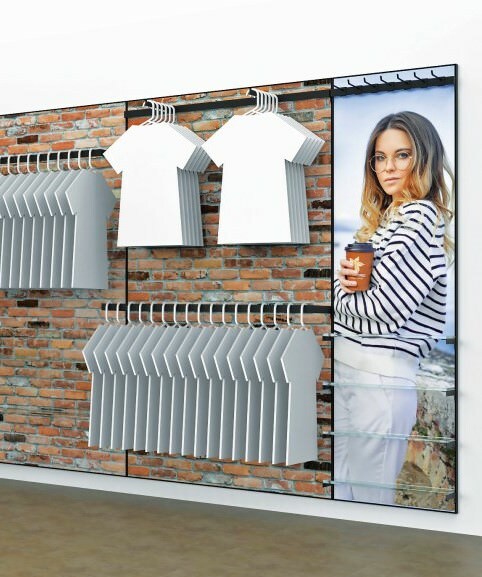 Our Fabric Wall merchandising system has been designed to change that, combining the modularity you have come to expect from our tried and tested range of slotted upright systems, with the flexibility of easily changed printed fabric graphics as used in our LED Lightboxes. These printed fabric graphics are supplied with a special rubber strip stitched around the perimeter which fits into a channel in the Fabric Wall system. This makes it simple to change the graphics quickly, easily and inexpensively, allowing you to modify the look of your store or retail space in minutes, without any specialist tools or skilled contractors. In fact, a whole concession or small store could be changed over in a matter of hours, allowing you to follow the seasons or trends as they happen. Available in standard 600mm & 1200mm module widths, with a fixed 2235mm nominal height, the system is supplied in kit form for simple assembly on site. Installation is simple with pre-mitred corners and our L-brackets holding things together, making it ideal for pop-up stores or retailers with fast moving product ranges or who are sensitive to changing fashions or seasons. Simply install the kits around the perimeter of your retail space, add the fabric graphics, accessorise with merchandising equipment from our standard accessories range, and you are ready to impress. The extrusion has been designed around two staples of the Peerless slotted upright range, the SU.20 and SU.32. Fabric Wall uprights use the same slot pitch as the rest of the Peerless upright range to provide a consistency throughout. This ensures that the existing Peerless components are compatible with the Fabric Wall system, allowing you to merchandise your store however best suits your needs. 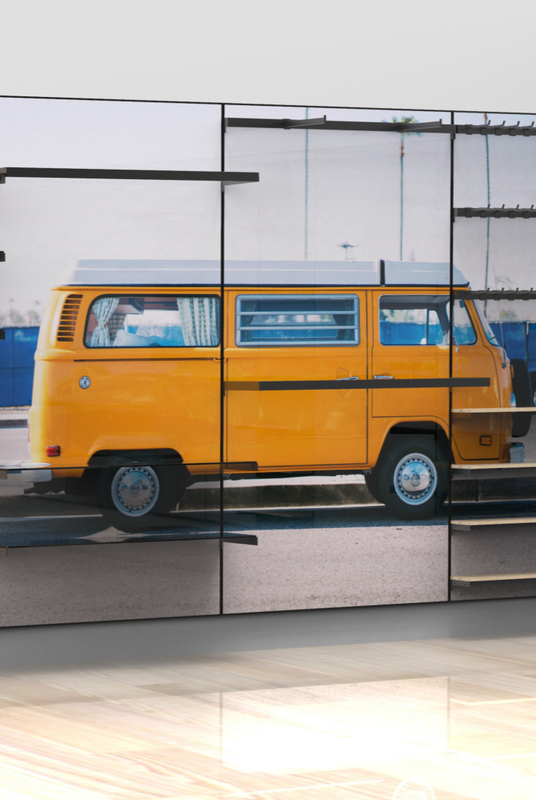 Our Fabric Wall system allows you to create almost any instore environment simply and inexpensively, but that means finding great imagery to use. Maybe you have an awesome marketing team, maybe you have external agency support, but maybe you don’t… don’t worry, we’re here to help. We can supply artwork templates for your agency to create the artwork for your Fabric Wall system or, alternatively, we can help you source images and put artwork together; we even have a selection of artworks ready to go! Start specifying your complete system today. Take a basic retail space, fitted with our Fabric Wall system around its perimeter. 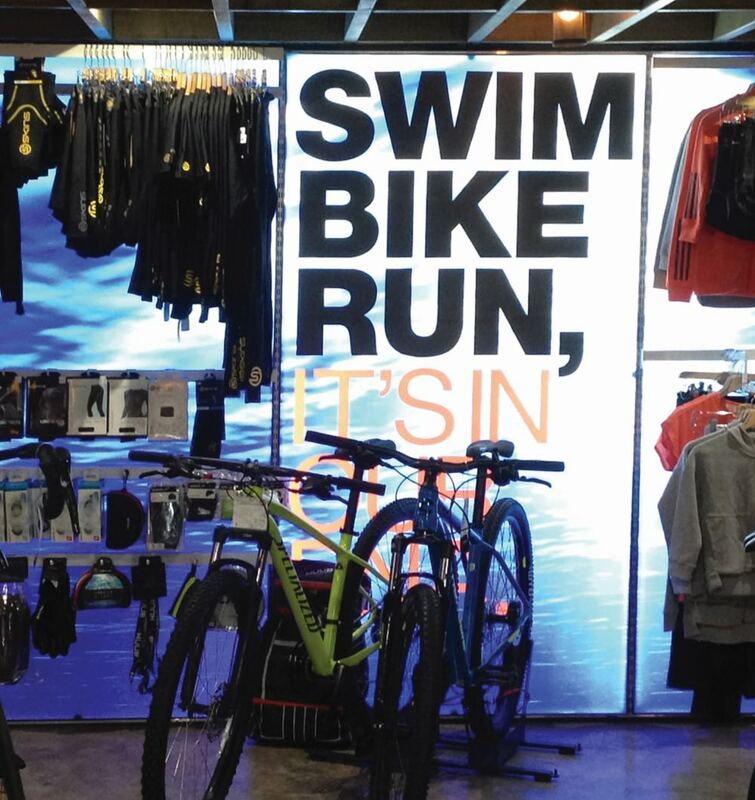 The store’s appearance is created by adding the printed fabric graphics; this means the usual constraints of materials, cost and practicality can be put aside, with the focus now on creativity, impact and branding. Each fabric graphic can be changed individually in minutes, by any member of staff, allowing you to be reactive to the changing needs of your customers. The system can also be illuminated with the addition of our special LED back panel insert to create striking displays. This is especially effective when used for promotional panels or hero panels, highlighting special offers, impulse purchases, lifestyle images or high margin consumer goods. 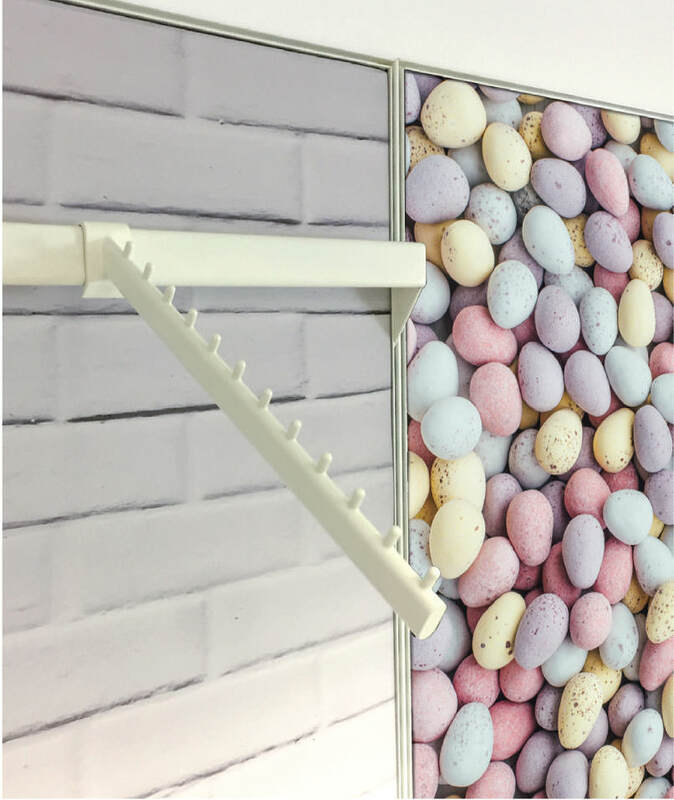 Our Fabric Wall system is supplied from stock in mill finished aluminium, but we can also supply it in a variety of finishes to suit your artwork, store design or existing colour scheme. 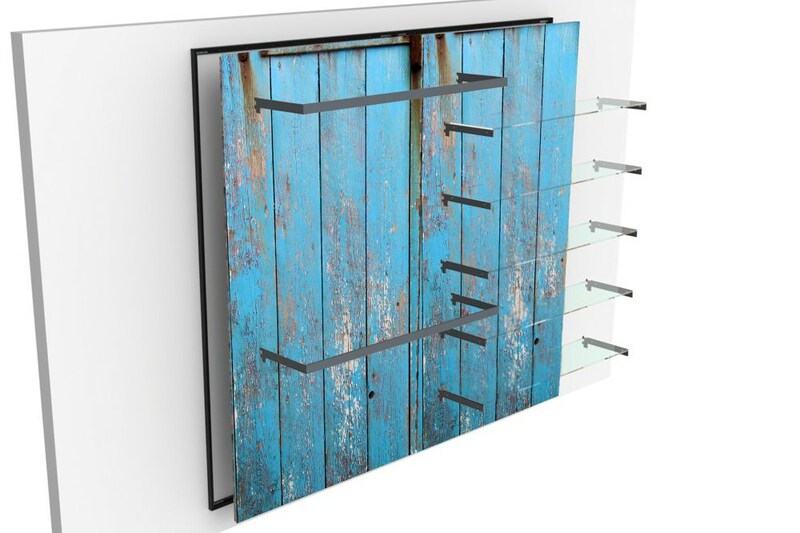 Along with our merchandising components (rails, brackets, shelves, forward arms and the like) we can powder coat the Fabric Wall system in any RAL colour, and the merchandising components can also be plated in a variety of traditional and contemporary styles and finishes, from polished chrome to an antique bronze, almost anything is possible.